(a) Be careful when replacing parts. Incorrect replacement could affect the performance of the steering system and result in hazardous driving. (a) This vehicle is equipped with an Supplemental Restraint System (SRS) which includes parts such as airbags for the driver and front passenger. Failure to carry out service operations in the correct sequence could cause unexpected SRS deployment during servicing and may cause a serious accident. Before servicing (including removal or installation of parts, inspection or replacement), be sure to read the precaution for the SRS (See page ). (a) After repairing a bus wire with solder, wrap the repaired part with electrical tape. The CANL bus wire and CANH bus wire must be installed together at all times. 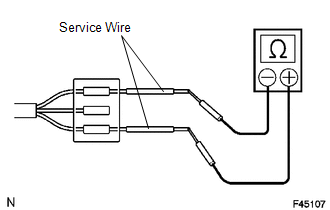 When installing, make sure that these wires are twisted, because CAN bus wires are likely to be influenced by electrical noise if the bus wires are not twisted. The difference in length between the CANL bus wire and CANH bus wire should be 100 mm (3.937 in.) or less. Leave approximately 80 mm (3.150 in.) 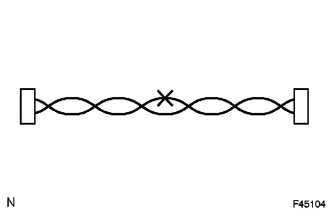 loose in the twisted wires around the connector. (b) Do not use bypass wiring between connectors. 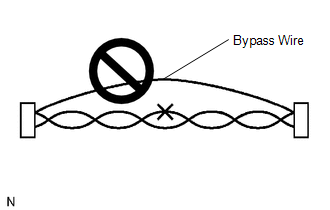 The ability of the twisted bus wires to resist interference will be lost if bypass wiring is used. 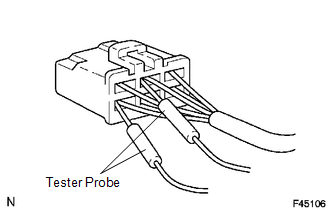 (a) When checking resistance with a tester, insert the tester probes from the backside (harness side) of the connector. (b) Use service wires to check the connector if it is impossible to check continuity from the rear of the connector. (a) If the CAN junction connector is removed from the vehicle for inspection or replacement, make sure to install the CAN junction connector and all wire harnesses to their original locations with tape and the clamps.